TSO has also earned recognition as the largest single provider of vision insurance plans in Texas and the Southwest. It’s very likely that TSO is a provider for your vision plan. A quick call to TSO Humble Eye Care Center nearest you can verify that important information. When patients need eye care, their first step is a complete doctor’s examination from a doctor they trust. They then turn to a trained TSO Humble optometrist to provide them with eyewear that helps them see and look better. Standards of care throughout TSO include eye doctors who have earned therapeutic licenses to treat many medical eye care conditions like glaucoma, macular degeneration, cataracts and childhood vision problems. 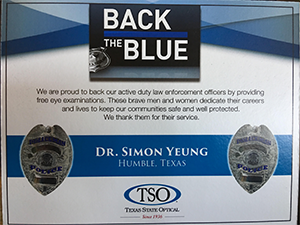 Combining professionalism and personal attention of Humble eye doctors who live and work in your community supports TSO’s promise to our patients to provide “Eyewear you want from doctors you trust”. We’re proud of our eye care history and excited about the future as we continue to help TSO patients enjoy the best vision possible. After all, we’re not Texas State Optical by chance, but by choice. We’ve grown into our name and will continue to work hard at keeping our patients satisfied and coming back with their family and friends to benefit from TSO’s long tradition of excellence in quality eye care and eyewear. Our Eye Care staff speak: English, Mandarin Chinese, Spanish, and Taiwanese! UHCO alumnus, Simon Yeung, OD, has established the Yeung Family Scholarship Endowment, a $30,000 gift that will provide scholarship opportunities for students.